After watching the Bengals first two games of the year in person, I’ll get the chance to relax a little and watch week three from my house. As many of you know who read my preview last week, I was in attendance at the game against Baltimore this past Thursday. I have to say, being at the game this year versus games last year is quite different as there is a different energy and atmosphere at the stadium. Fans are more optimistic, more into the game, and a whole lot louder! It was an awesome time last Thursday and I am looking forward to my next game against Miami. Until then, I will enjoy watching the next two games on TV. To briefly recap last week’s game, we saw the duo of Andy Dalton and A.J. Green look unstoppable. We continue to get big turnovers on defense. But that’s not what I want to recap, it’s the injuries. As many of you know, in this weeks game against Carolina, the Bengals will be without center Billy Price and running back Joe Mixon. Price is an important piece to the offensive line, however Trey Hopkins did not play bad in his place. The biggest injury for me is Joe Mixon’s. We have seen the offense lean on him early this year, and after two weeks he was second in the league in rushing. According to Mixon, he is feeling awesome after his surgery and it sounds like we could see him back in week 5 or 6. Now onto week 3, where the Bengals travel to Carolina to play the Panthers. The Bengals sit atop the AFC North, undefeated. The Panthers are playing for their hometown that was just hit with a devastating storm. If the Bengals can pull out the win they will be sitting in the driver seat in the AFC North. The Bengals Linebackers vs. Cam Newton and Christian McCaffrey – The Bengals secondary should have no issue containing the Panthers wide outs, which puts all the pressure on the front seven to contain McCaffrey and Newton. Cam can be frustrated, which at times can affect his play. If the Bengals front can get to him early and knock him around it could be enough to throw off the offense. McCaffrey is one of the best pass catching backs in the league. Covering running backs with linebackers hasn’t always been the Bengals strong point. This offense runs through these two guys. This will be the toughest test of the year so far, the Bengals must stop Cam and/or McCaffrey to disrupt the offense. Stop one of them and it should stop the entire offense. Trey Hopkins vs. Kawann Short – As I mentioned before, Hopkins will get the start at center in place of the injured Billy Price. Last week Hopkins filled in for Price, giving up zero sacks and only a handful of pressures against a very talented Ravens front. This week he had the whole week to prepare for one of the league’s top defensive tackles, Kawann Short. If the Panthers are smart they will have Short lined up over Hopkins all game long as it should be one of their best mismatches up front. If Hopkins can contain Short in this game, Bengals fans will be able to sleep a little bit easier with Price on the sideline for the next 2-4 weeks. Exterior Bengals Pass Rushers vs. Back up Offensive Lineman – With both starting tackles, Matt Kalil and Daryl Williams, out for this game and starting guard Trai Turner in the concussion protocol, the Panthers could be down three starting lineman. This should be a huge advantage for the Bengals talented defensive line. The Bengals d-line dominated during the preseason but haven’t had a “dominate” regular season performance yet. 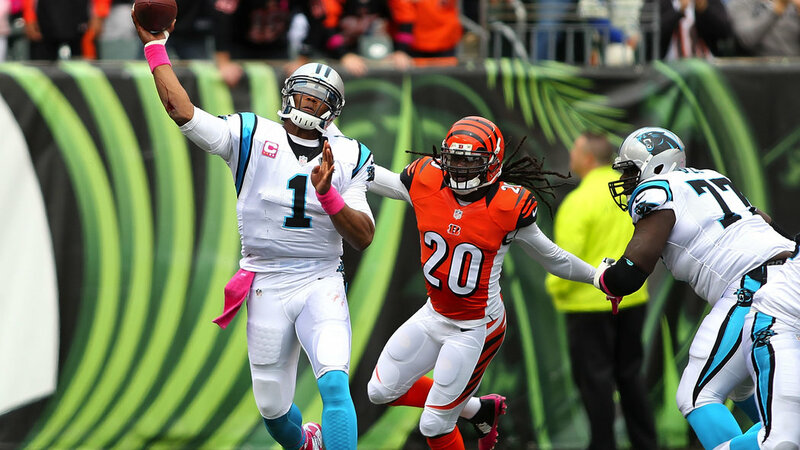 The Bengals should be able to get loads of pressure on Newton, disrupting his passing game. Newton can scramble, but as long as the Bengals linebackers contain him, he should see pressure in his face throughout the game. Last week the Bengals again did a very good job of overcoming injuries and still pulling out a win. They will again have to show us this week that they can continue to win with “the next man up”. They are also underdogs going into this game for the third straight week. This will be a tough game on the road with a few notable injuries. This is the game that will show us just who these Bengals are. My Prediction: Bill Lazor has had 10 days to plan for an offense featuring Giovani Bernard. I have no doubt that Lazor will have a very good game plan for Sunday. I don’t see the offense missing much of a beat. It will all come down to the defense, if Cincys D can contain Cam Newton and frustrate him early I think the Bengals can win this game. The Bengals are dealing with injuries yes, but so are the Panthers. In addition to their lineman, Cam’s favorite target and pro bowl tight end, Greg Olsen, is also out for this game. The Panthers injuries should create more of an impact than the Bengals, and I think this is the difference in the game. I think it will be a close and tightly contested matchup but think a Randy Bullock field goal late in the game is the difference.